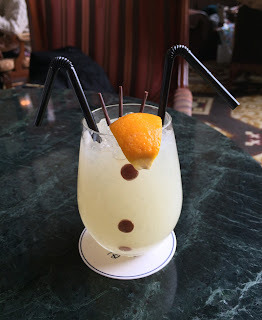 At Dreamers Lounge in Tokyo Disneyland Hotel served "Anna and Elsa's Frozen Fantasy" Special Non-Alcoholic Cocktail Inspired by Olaf from February 15 to March 18, 2016. It's made with apple juice, Calpico, lemon juice and passion fruit syrup, and the drink was slightly yellow. The nose was made with orange and the buttons were chocolate. It's sweet and lightly sour like yogurt.